Illusion Knits surprise and delight by inviting the viewer into a personal interaction with the artwork, engaging curiosity and exploration. They can be perfect for a personal collection or to represent corporate entities. I am the artist/owner of Tanya Cunningham Textiles, LLC, which I have created to market my custom Illusion Knits. 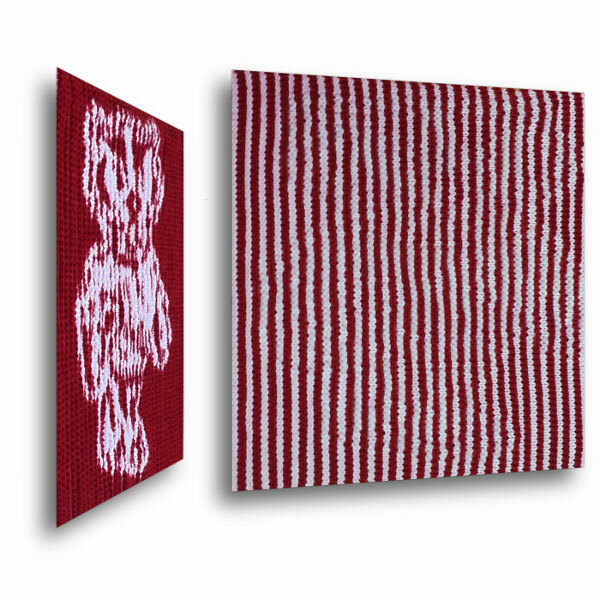 I am the only person in the world utilizing a process I invented, which enables me to convert complex images into knitted, illusion wall hangings and fabric. When an Illusion Knit is viewed head-on, only thin, vertical stripes in two colors are visible. 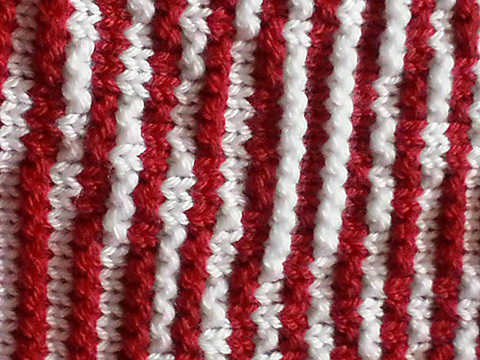 Each vertical knitted stripe is composed of stitches that either bump out, or are recessed. When the piece is viewed from the side, one sees only those stitches that bump out, while the recessed stitches disappear from view. In this way an image emerges that is not visible when looking at the piece from straight ahead. My process for creating Illusion Knits began with an old hand knitting technique, sometimes called “shadow knitting.” Improvements to this old technique have made it possible to produce highly complex knitted images by introducing an apparent third color, even though the pieces are knitted in only 2 colors. I have been perfecting my process, creating each piece of knitted artwork individually, on a vintage knitting machine. I use a modern computer to create very complex digital images and then, through the wonders of hacking, I am able send that information to the knitting machine, which will select needles for me to knit in the correct sequence to produce the desired pattern, in very much the same way that a weaver works with a loom to create a pattern in the fabric. The program I use to communicate in this way with a 30-year old knitting machine is called img2track, which was developed for me in 2013 by Davi Post. Davi and I are both members of Sector67, a hacker space/community workshop in Madison. That is where we met and began our collaboration on img2track. The possibilities for artistic expression with this unexpected intersection of art, machine, craft and computer have utterly captivated my imagination! Although I have been creating fiber art for decades in many mediums and with many techniques, I find that I am uniquely drawn to illusion knitting. The endless fascination of mystery and revelation inherent in this form evokes intense responses from viewers. The pieces seem to create an environment that encourages and allows observers to experience an almost childlike openness to uncertainty, curiosity, and joyful surprise. I believe that this highly unusual textile presents a wonderful opportunity for individuals and institutions to place art in their environment that can provide personal enjoyment as well as represent their passions and personalities in an unfailingly delightful and engaging way. Visit the Gallery to see all of my Illusion Knits. You can see more of my knitted work created using img2track at my Ravelry page. See video examples of my Illusion Knits on Vimeo.